Palaeoscincus (meaning "ancient skink") is a dubious genus of ankylosaurian dinosaur based on teeth from the mid-late Campanian-age Upper Cretaceous Judith River Formation of Montana. Like several other dinosaur genera named by Joseph Leidy (Deinodon, Thespesius, and Trachodon), it is an historically important genus with a convoluted taxonomy that has been all but abandoned by modern dinosaur palaeontologists. 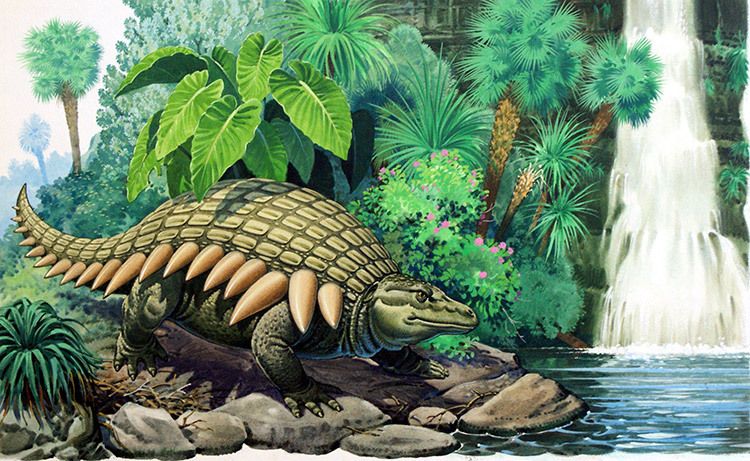 Because of its wide use early in the century, it was somewhat well-known to the general public, often through illustrations of an animal with the armor of Edmontonia and the tail club of an ankylosaurid. One of a superb series of Dinosaur paintings created for the book 'The Mysterious World of Dinosaurs'.